The 2003er Egon Müller Scharzhofberger TBA sold for €12,000 per bottle. A surprise? No. Mosel and German wines are the most expensive in the world. 2003er Egon Müller Scharzhofberger TBA | €12,000 per bottle! Every year, the Grosser Ring / VDP Estates sell some of their most prized wines via an Auction. 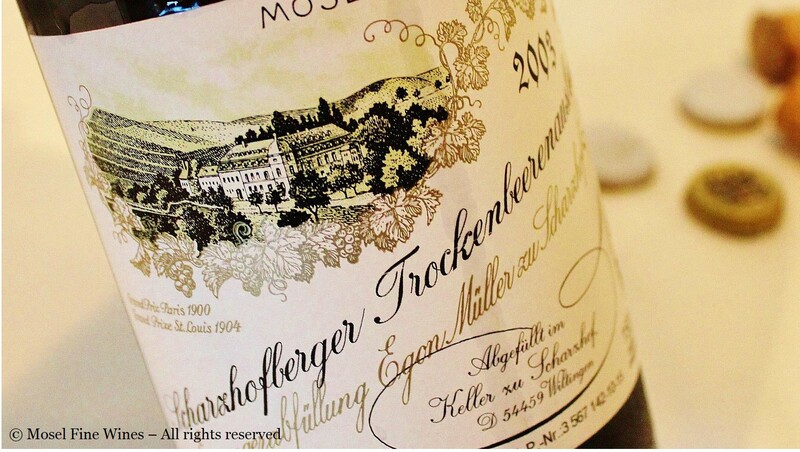 At this year’s Auction held last Friday (September 18), the Weingut Egon Müller sold its 2003er Scharzhofberger TBA for a staggering €12,000 per 75 cl and €5,500 per 37,5 cl ... and these prices do not even yet include commissions, transport, import duties or sales taxes. To the best of our knowledge, this makes this 2003er Egon Müller Scharzhofberger TBA the most expensive newly released wine in the world ever, “easily beating” the coveted wines of Burgundy (e.g. Domaine de la Romanée-Conti), Bordeaux (e.g. Château Lafite Rothschild, etc.). Recently, the wine price website wine-searcher produced a list of the world's Top 50 most expensive wines. The remarkable thing is that most of the wines are red Burgundy and that there is hardly any Bordeaux on the list. Also, there are “only” three German wines, all three from the Mosel. Also the Weingut Geltz-Zilliken entered the exclusive club of the "€1,000+" wines with its perfect 2005er Saarburger Rausch TBA (Auction), which went for €1,100 at last Friday's auction. Moreover, also top makers from other German regions (among which Schloss Johannisberg, Weingut Robert Weil and Weingut Dönnhoff) regularly sell their auction wines for very high prices. One may debate whether any wine is “worth” paying these amounts. However, the new record price achieved by the 2003er Egon Müller Scharzhofberger TBA underlines, if need be, the continued high appreciation by wine lovers for top German wines.